Licenses are made available to you immediately once your order is completed. There is no need to reinstall the software. Your existing installation will be updated by copying your purchased unlock code. If you haven't already, Install MidiCo. 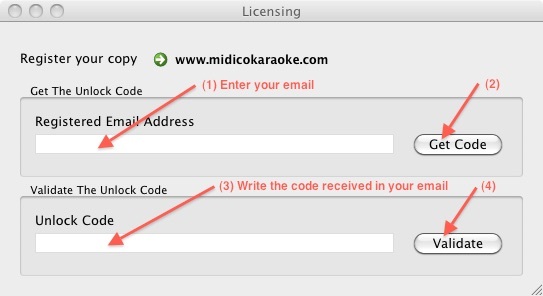 Write your e-mail address (1) and press the "Get Code" button (2). You will receive the unlock code in your e-mail. Write the unlock code (3) and press "Validate" button (4). Please note that: the unlock code you receive is a "One Time Code". If you write a wrong code or if you need reinstall MidiCo, just press "Get Code" button again and copy the new code received.